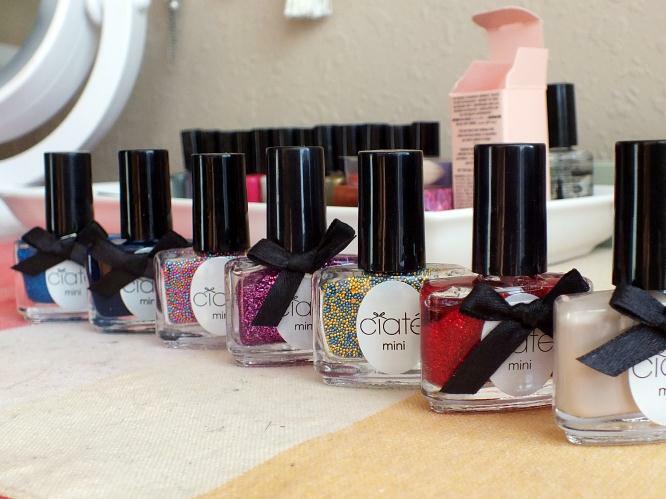 It’s about time, but I’m finally finishing up the Ciate Mini Mani Month box. I decided to go ahead and wear five colors at once and then just take a picture of the last 7 bottles. I got ridiculously behind. With work, switching jobs, interviews, and life, painting my nails didn’t happen much. 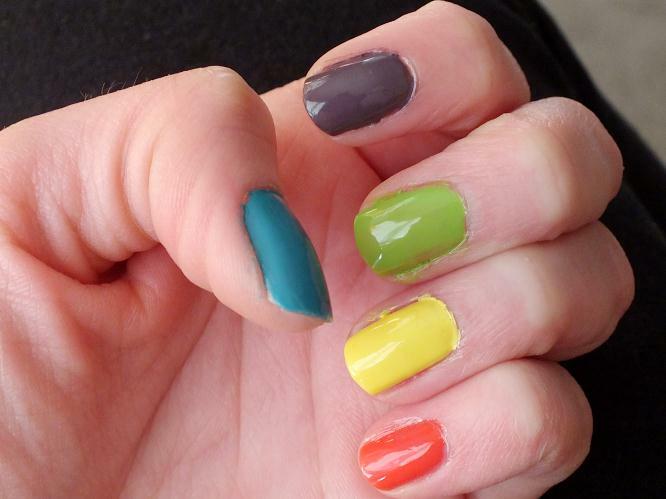 The yellow(big yellow taxi), green (mojito), and orange (speed dial) were by far the most difficult to apply thus far. They were very watery when I applied them. It took many, many coats to get a solid color formed. I love the color names of this whole box. Ciate is definitely going to have my vote for favorite nail polish for a long time. 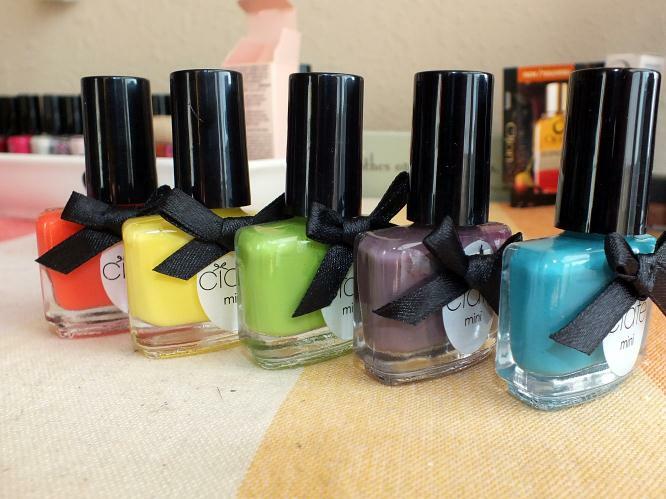 Which is your favorite: Ciate, Essie, OPI, another?? Next up in the Ciate Mini Mani Month is Twilight! This black nail polish has flecks of gold in it making it a great choice for outfits. It goes with everything yet has a bit of something extra to it. The gold flecks really come out in the sunlight, making it look more gold than black. I will admit, this nail polish was more of a pain than any others I’ve used so far in this set. It dried quicker, probably because of the high density of gold, but this caused it to clump while painting so it was very difficult to get it even. Please forgive my old lady looking hands, the cold and dry winter weather always makes my skin look like I’m well over 25 years! For the next day in the Ciate Mini Mani Month, we have Halo. It’s a sheer glittery nail polish that is definitely meant to be worn over another nail polish. To me, it’s one of those that you have that you think about using, but never actually use. In these pictures I have about 4 – 5 layers of this nail polish on so that you could see the effect and its sheerness. So, I kind of called out Birchbox in my post for Ipsy this month. and yes, they deserve it because I got another food item in my box. At least, the other items make up for it, but it still is not okay to put food in a freakin’ beauty box! Here’s the box though.. Some pretty good items I think and a little more appropriate than the last couple of boxes. I love my monthly beauty box subscriptions. I have three as of the moment: Glossybox, Birchbox, and by far my favorite, Ipsy (formerly known as MyGlam). Anyway, since I have yet to post on Ipsy, I subscribed during my hiatus. Here is my first post on it. I LOVE IPSY! It’s a full bag of makeup, and oh yeah, you get a makeup bag every month. So here’s this month’s bag. Fabulous stuff for a $10 price tag. and of course the chocolate makeup bag which it all comes in. Plus, every month you get deals if you purchase the products in the bag. For example: if you wanted a Marvelous Moxie Lipgloss from bareMinerals, you would save 10%; If you wanted a nail laquer from nailtini, you would save 25% this month. And its every item that you get a different percentage off. Fantastic deal, right? So if you haven’t signed up for it yet and are still hoping that Birchbox or Glossybox will actually put some quality products in their boxes, I urge you to try this one. If you want to know more about how any of these products perform, just let me know! This is really, really late. Like, I mean almost an entire week late. I had it done just never posted….